The RAVPower Portable Solar Charger is one of our top 10 best portable solar panels. It currently holds a 3.9 star rating on Amazon and a 60% positive rating. However, it also is the #2 best seller in the "Solar and Wind Power Parts and Accessories". So, let's see why people loved or hated this device. The RAVPower portable solar charger is about the same size as similar solar chargers we have reviewed. It sizes at 6.7 x 3.5 x 0.8 inches and weighs under a pound, at 13.4 ounces. While it is slightly bigger than your average smartphone, it is still compact and lightweight making it very easy to take with you wherever you go. Inside this fairly small device is a massive 15000mAh battery. We have recommended that the minimum capacity for a solar power bank be 10000mAh, so this one should be more than enough. A full charge of the power bank has enough power to charge an iPhone 7 more than 4 times, the 7 Plus about 3 times and the Galaxy S8 more than twice. Other users have seen that they were able to go for 4 days, with nearly constant use, before having to recharge the power bank. For a relatively small device, it sure can pack a punch. Speaking about power, it also has dual USB ports, each putting out 2.1 amps. Both USB charging ports also feature iSmart charging technology which is like many other quick charge tech out there. It is able to deliver the fastest charge possible to your devices. The only downside is that 2.1 amps is the max output for these USB ports. Some of the others we have seen have a max of 3 amps for some bigger devices. Of course, it also comes with a micro-USB charging port which allows for DC input charging of the power bank. As for the solar capabilities of this device, they seem to follow the same trend that we have been seeing a lot. That trend is that the solar panels, while good for emergencies, they seem not to be made for it's sole power source. 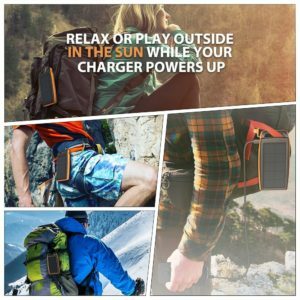 The RAVPower portable solar charger is no different. It is clocked at 1W/250mA, which is not bad, but would still take a very long time to charge the power bank from empty. In fact, the company actually quotes "It takes a week to obtain a full recharge when only powering with sunlight." That being said, if you fully charge the bank at home, take it out with you, and leave it hanging on your backpack solar charging, it will easily keep your power bank level full. The body is really nothing special. The solar panel and other circuitry is surrounded by a standard plastic shell. An orange rubber sleeve is also placed around the plastic shell to give it some cushion and to make it easier to grip. The whole device is waterproof, dust proof and shock proof. So you can feel confident when bringing this on any outdoor adventure. In addition, it also features a handle at the top of the device. By using this, you can easily attach it to the strap of your backpack for convenient solar charging while you walk. The other features of the RAVPower portable solar charger are among the same as many other solar chargers. There is a fairly big LED flashlight on the back of the device that gives surprisingly bright light. Simply hold the power button for 3 seconds and the light will activate. The device also features 5 pilot lights which indicate the level of battery available as well as whether the device is on or off. The pilot lights make for an easy gauge of power and are reliable in terms of telling how much power is available to you. Each indicates 25% of the power. RAVPower was founded in 2011 and is owned by Sunvalleytek, a brand of the Chinese owned Sunvalley Group. Their original focus was on laptop and cellphone batteries, but has recently switched their focus to battery chargers, which includes portable power banks and solar chargers. In December of 2015, RAVPower launches their Turbo+ 20100mAh external battery. It was the world's first portable power bank to include both Qualcomm Quick Charge 3.0 technology and an USB-C port. They have since patented their own exclusive smart/quick charge technology called iSmart, which is able to do basically the exact same thing as other quick charge tech out there. Detect your device and supply it with the optimal charging current. All of their devices are CE, RoHS, and FCC certified and an 18 month warranty, plus another 12 months for product registration. All of their products are sold through the Amazon marketplace, with quality Amazon customer support. The size of the RAVPower portable solar charger is great. It is small and light enough to pack along with your other gear and not have to worry about it taking up a lot of space. Also, the handle featured at the top of the charger makes for seemless carrying on your backpack, or really anywhere you want. The battery capacity is pretty huge. 15000mAh in such a small container is great. It easily has enough power to last you throughout the day, and then some. Plus the solar charging allows for you device to essentially never drop below 50%. The build of the device is also very sturdy. It is waterproof, dust proof and shock proof. Plus, it is very easy to hold, due to the rubber sleeve. The surprisingly large and bright LED flashlight located on the back of the device is a great addition. It helps when the outside light gets low, and it does not consume too much of the battery's power. RAVPower patented iSmart charging technology ensures that your device will get nearly the same charge as it would if you plugged it into a wall. The price for this device is great. A lot of power for not a lot of dough. The dual USB ports only max out at 2.1 amps. It may make charging larger devices, like iPads and tablets, a bit slower. Solar panel is still not that great. While it is fine for keeping your power bank at a good level, it would take a very long time for it to completely charge the bank. However, they do advertise and warn users about the week long charging time using solar, so at least they are honest. Leaving it in your car and solar charging through the windshield can damage the battery, due to the excessive heat. The solar panels are also not sensitive enough to be even close to efficient during overcast days or indoors. For the money, the RAVPower Portable Solar Charger is a great device. The battery capacity this thing is capable of is awesome. While the USB charging ports are a bit lackluster, they can still handle your basic smartphone and more. The solar panel issue is not surprising, but nonetheless an issue. If you expect to be able to only use solar power for this device, you will be disappointed. However, the fact that the company comes right now and tells you how long a full charge will take using solar, is a nice gesture. Be sure you read the description before you buy it. While it may not be the most powerful solar charger we have seen, the battery capacity is great for the price. If you are a casual hiker and enjoys having access to your phone, this may be perfect for you. Right now, you can grab one for $29.99 on Amazon. To check out the rest of the top 10 best portable solar panels, head on back to Green and Growing. Here are some top questions that I found for people seriously considering buying the RAVPower portable solar charger. Does the device come fully charged? Yes, it comes right and ready to go when it arrives to you. What devices is this compatible with? Any device that uses a USB 5V charging system. Are both USB ports max at 2.1a? Yes, both have a max output of 2.1 amps.